This view of St Lawrence Jewry Church on Gresham Street and the Guildhall in the City of London. The Guildhall was an important medieval building - it was the centre of civic government for the City, where the Lord Mayors and Sheriffs met, and where important trials were held. This view shows its Gothic entrance porch which was completed in 1430. As can be seen in this view, it was highly decorated with numerous statues in niches under canopies. 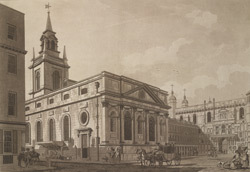 To the left is the Church of St Lawrence Jewry, a medieval church which was rebuilt in 1671-7 by Wren. Its impressive classical east front with portico, lines the approach to the Guildhall.